Today I have a secret recipe for a classic meatball served at Buca di Beppo. This flavor-packed meatball is made with a blend of ground beef and ground Italian sausage. 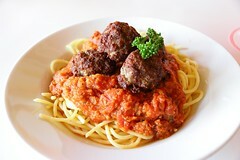 Serve these meatballs with your favorite pasta and marinara sauce. In a large mixing bowl. Pour in the salt and pepper and seasonings. Mix in the bread crumbs. Using your hands mix everything until completely combined. Divide meat into 4-5 sections and form each section into a meat ball. Place in a 9 x 13 baking dish. Serve hot with your favorite pasta and sauce. I’ll be making this Buca de Beppo ASAP! Have one comment/question. As to the meatballs themselves, the recipe instructs to make 4 or 5 of them. Those would be large, of course. Mine will be small. Did the recipe mean what I thought it meant?